The special hockey card treatment Stanley Cup-winning teams have gotten in recent years makes this Blackhawks’ fan jealous.The ‘Hawks won the Stanley Cup in 2010, but no commemorative sets or arena giveaways marked the occasion. 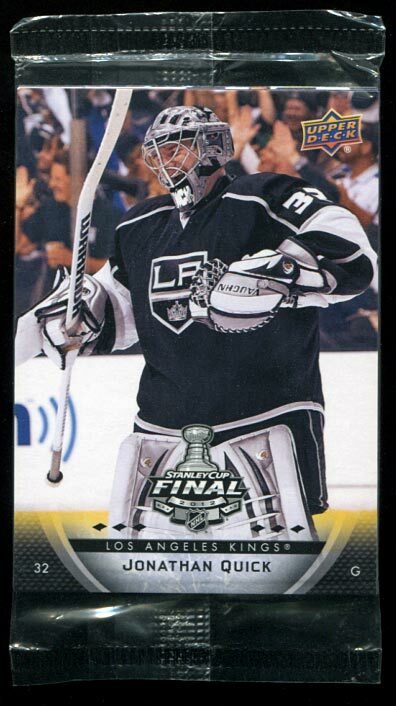 A year later, the Boston Bruins got their own 30-card commemorative set, while Los Angeles Kings fans received this 6-card giveaway during the 2012 Stanley Cup Finals. 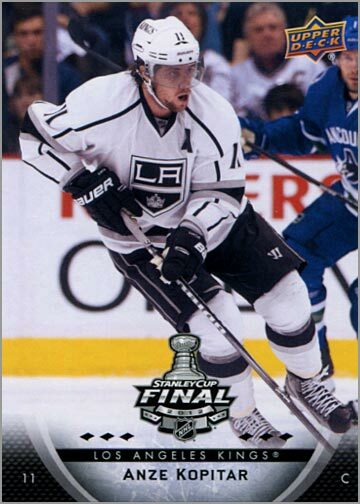 Wow…Kings’ fans got to go to a Stanley Cup Finals game AND got a special set of hockey cards. The only thing that would make that scenario better is free nachos at the concession stand. 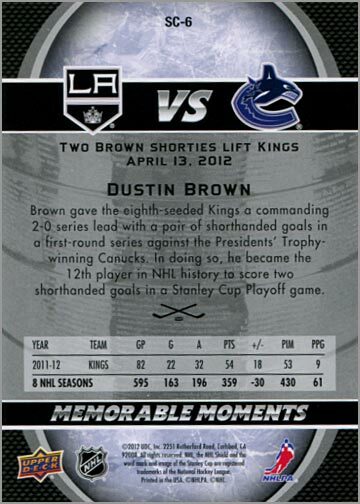 The cards are printed on thinner stock than normal Upper Deck hockey cards. They are devoid of gloss or foil. 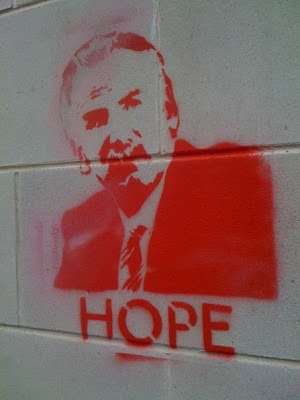 For a freebie, though, that really does not matter. The set came sealed in a cellophane wrapper. 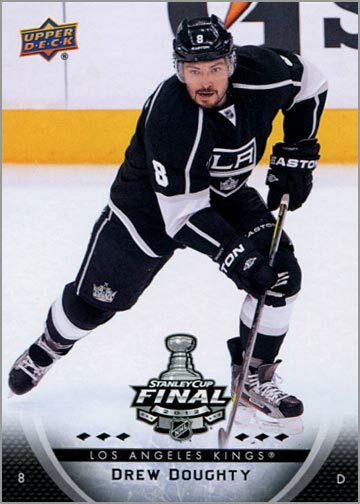 Six cards of the Kings’ best players during the first two rounds of the playoffs are in this set. 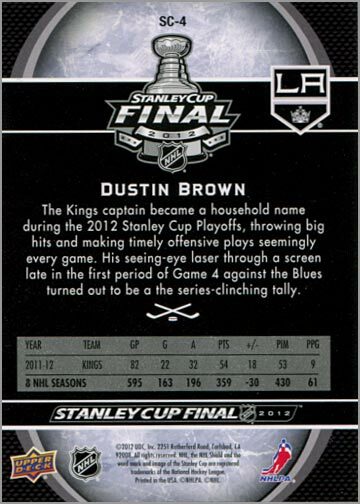 The players included are Anze Kopitar, Mike Richards, Jonathan Quick, Dustin Brown, Drew Doughty and a second card of Dustin Brown. 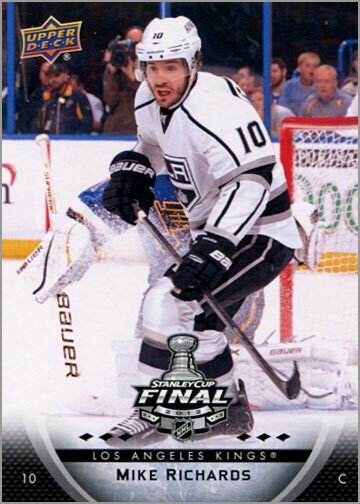 So, while this isn’t a comprehensive team set, each card has relevance. The design of these cards is a bit confusing. 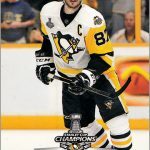 The cards have a Stanley Cup Final logo on the front, but the photos used are either from Round 1 or Round 2 of the playoffs, and not the finals. 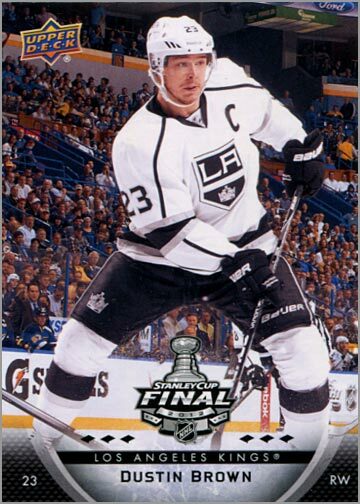 Card #6 does not have the Stanley Cup Finals logo on it. Why the last card looks different is anyone’s guess. 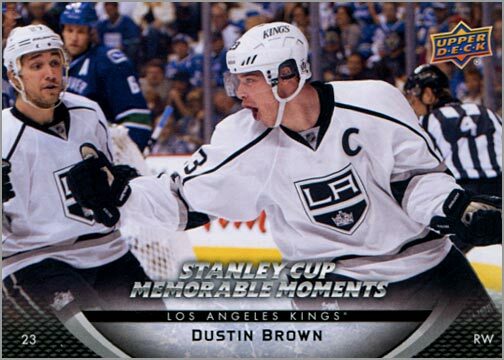 My theory is that all the cards were originally supposed to say “Stanley Cup Memorable Moments,” but a decision was made to use the Finals logo instead.Given the fact that this set was produced rather hastily, I think the last card somehow got overlooked during production. 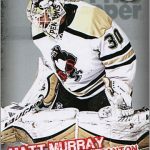 The design of the back of cards 1 to 5 looks very sharp. The white text against the black background is very easy to read, and explains a particular feat the pictured player accomplished in the playoffs. 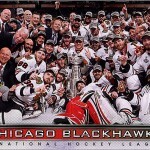 Below that are the player’s stats for the 2011-12 regular season and their career totals. 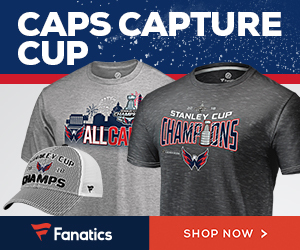 Season stats seem unnecessary here, as the focus of this set is the playoffs. The last card is a mess, though–black text superimposed over a gray background with the Stanley Cup ghosted behind it. It is an unnecessarily complicated design that is hard to read. 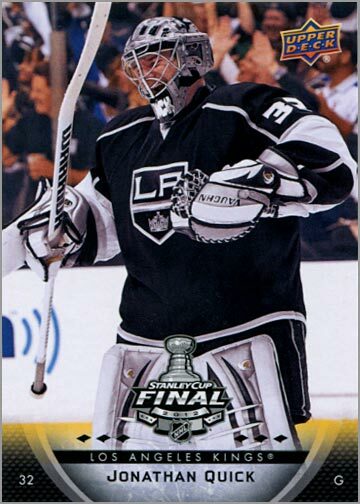 The set is a unique collectable for Kings fans who like hockey cards. 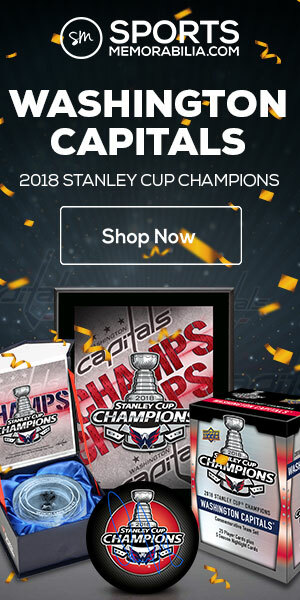 Putting the Stanley Cup Final logo on cards that were given out at the Finals–but actually have nothing to do with the Finals–is a bit of a misguided design choice. 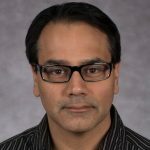 Here are images of the entire set.